- Search and Browse nearby Campgrounds. - Discover PA parks near your location. - Get Campground details on amenities, rentals, highlights, contact details and more. - Search for campgrounds based on amenities. We, at Passport America, are extremely happy and proud to provide FREE apps for Android, iPhone, and Amazon Kindle Fire™ users. Since 1992, Passport America is the Original 50% Discount Camping Club. Presently offering over 1,800 locations for Members to save while camping in the US, Canada, and Mexico. We consider our applications to be the best interactive camping directory of its kind. They are free for anyone (Members of Passport America and non-members) who would like to browse our directory of Participating Campgrounds, RV Parks, Resorts, etc. 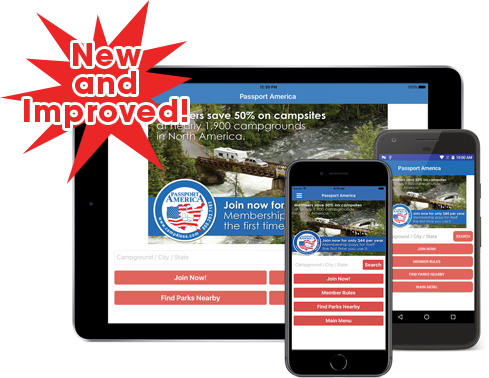 Compared to our website and printed camping guide, only our applications provide the ability to locate parks based on your current location, and handset users have the convenience of quickly calling participating park of interest directly from the park’s Passport America listing. Plus, handset users have the ultimate convenience of calling a Passport America Customer Support Representative by just the touch of a button. Additional features of the application include mapping and saving favorite camping locations for future use. RV Enthusiasts and Campers can all enjoy the benefits of our low cost membership. Our applications are available for free to Members of Passport America and non-members who would like to explore our participating campgrounds, however, only Passport America Members can receive the 50% Discount Off of the nightly camping fees.